Designed by Henry van de Velde, Villa Esche is a museum and events venue located in the town of Chemnitz. Through the rest of the 20th century, this villa was passed down generations and has served as Seat of the Soviet Military Command, an educational institute, and many more. 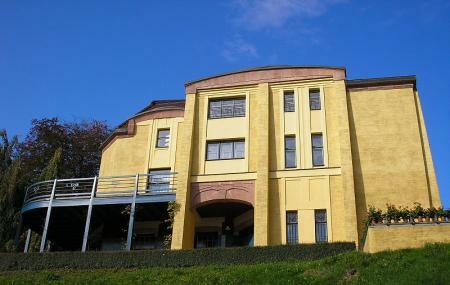 Regarded by many as the masterpiece of European architecture, this villa was renovated in the beginning on the 21st century and is today a prime example of the blend of business, art and culture in Chemnitz. Housing a meeting place, an event location, Henry van de Velde Museum, concert podium, and a restaurant, Villa Esche is used for many conferences, seminars, concerts, readings, discussions, banquets, receptions, presentations, weddings, Jugendweihen and other events. With rooms ranging between 55 to 252 square meters, extensive gardens and an in-house restaurant, this venue is quite a hit among the locals. For office and restaurant timings, kindly refer to the museum website. How popular is Villa Esche? People normally club together Sachsisches Industriemuseum and Museum Fur Sachsische Fahrzeuge Chemnitz E.v. while planning their visit to Villa Esche. Es ist schon bemerkenswert, wie viele Fabrikanten-Villen in Chemnitz existieren. Eine schöner als die andere. Prima wenn jemand die Mittel aufbringt und ein funktionierendes Konzept auf die Beine stellt um diese zu erhalten und damit das Kultur- und Freizeitangebot der Stadt zu bereichern. Dank an die GGG.